Roman began playing bass guitar at 1985 at the age of 15 and enjoys sharing his knowledge of the instrument with others. His emphasis is on Funk/ Slap bass, with a blues background. 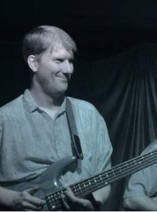 Roman has held down the bass duties for The Royales, Voodoo Birds, Fat Pocket, Toads on Acid, and the Misprints, and has taught bass to a wide variety of individuals and groups for several decades. ​To schedule, use the contact form or call 740-707-8435.